It is going to be a very quiet week as it is Thanksgiving and Black Friday week here in the states. 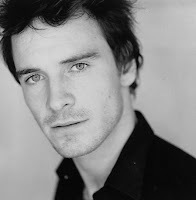 So there may not be much to update on the Michael Fassbender front. Also, starting next week, which will be December already, the New York Critics Choice will start off the year end season of selecting critic's choices of The Best in the acting, directing, and film categories. The timing of the limited US release of Hunger is pivotal as it is still slated for a December 5th release to get Michael and Steve's names out there. On a fun note, I wanted to mention how one of my long-time favorite actors remind me of Michael. I watched 'Strange Days' this weekend, and it is a 1994 film starring Ralph Fiennes. When I first notice Michael I couldn't help but thought how much he reminded me of another actor, but I could not figure out whom that other actor was... until I saw Ralph lately, and I was like, 'Yeah, he looks like Ralph's baby half-brother!' The deep set blue eyes, broad forehead, seductive mouth and grin, and a damn good actor to boot! And then I Googled a photo of Ralph and tah dah! I found one to match one of my favorites of Michael, and you can't deny it - even the bone structure is nearly identical! If you are not familiar with Ralph Fiennes, I urge you to Netflix his films, especially 'Quiz Show', 'Strange Days', and 'The English Patient', just to soak up his beauty. 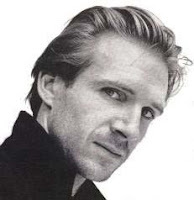 If you want to see him bad and evil, rent 'Schindler's List', 'Red Dragon', 'In Bruges' - and he plays Voldermort in the last two Harry Potter movies. Like Michael, Ralph can play good and bad naturally and because he's gorgeous, when he's bad, you still want him in a naughty way. Also, I imagine that in due time, in just a matter of months, due to Michael working on a Quentin Tarantino film, his profile will be growing rapidly and he will be interviewed and maybe even be on the cover. So I would like to suggest that you keep an eye out for Men's Interest magazines, especially the UK/Euro versions as they will be interested in showcasing him starting in the Springtime, if not earlier if they're smart. And because he's so damn good looking, they'll be wise to put him on the cover all sexed up, or at least have his name in big bold letters on the magazine cover. So watch out for that. Even you have to swallow your pride and pick up a magazine with a half-naked airbrushed silicone implant skank on it, if Michael is in it, you are obligated as a Fassy Fan to read the article or snipet. Okey dokey? I think that you aren't alone in your perception of Ralph and Michael. There have been other fans who have thought the same thing. I haven't had the privilege to see a lot of Ralph's work, but what I have seen, I've admired. Only until I saw Strange Days this past weekend then it clicked with me. Ralph was 31 when he made that, the same age that Michael is now, and they look very similar. If you haven't seen it, you should rent it. And Ralph's name has been popping up for Oscar consideration this year too for The Duchess. It'll be his third nomination. they defintely have very similar piercing eyes! I saw In Bruges earlier in the year and LOVED it. IT was 2nd to only HUNGER this year.